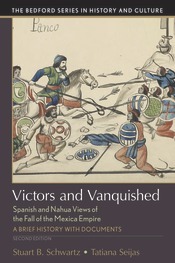 The new edition of Victors and Vanquished highlights recent advances in the field of Mesoamerican ethnohistory that allow for a more thorough and nuanced understanding of the fall of the Mexica empire. A revised introduction is followed by eight chronological sections that illuminate the major events and personalities in this powerful historical episode and reveal the changing attitudes toward European expansionism. Within each section, the authors have added a number of new text and visual sources designed to enrich and reframe the story of the conflict. Readers of the revised edition will also find updated section introductions and headnotes, and study questions for students. A list of the principal individuals mentioned in the texts, a glossary of Indigenous language terms, and a new bibliography as a guide to further research are also included.